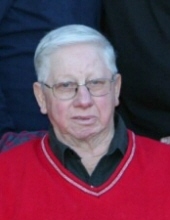 Larry D. Elmore age 79 of Newton passed away Monday, December 17, 2018 at the Newton Care Center, Newton, Illinois. Funeral services celebrating Larry’s life will be held at 10:00 a.m., Friday, December 21, 2018 at Crain Funeral Home, Newton with Pastor Phil Young officiating. Visitation will be held from 5:00 p.m. until 7:00 p.m., Thursday, December 20, 2018 at the funeral home. Burial will be in the Chapel Cemetery, Falmouth, Illinois. Memorial gifts in honor of Larry may be made to either the Oblong Children’s Christian Home or to the Pinehaven Christian Children’s Ranch. Larry was born on September 22, 1939 in Flint, Michigan the son of Alton D. and Agnes Byrdean (French) Elmore. Larry married Carol Jean Tarr on November 27, 1960. She preceded him in death on September 17, 2007. In addition to farming and raising livestock, Larry worked for Roadmaster in Olney for forty-four years. He was a member of Fairview Christian Church in Newton. In his free time, Larry loved spending time with his grandsons. He enjoyed taking them fishing, hunting and riding the four wheelers and golf cart. He was a gifted mechanic and would tinker to get most anything running. Larry loved his family and children. He and Carol opened their home and hearts to many children throughout their lives. Larry will be loved and remembered by his children Shelia (Randy) Boyd of Windsor, IL; Eric (Amanda) Elmore of Newton and Shanna (Dan) Adkins of Newton; grandsons Justine (Lindsey) Elmore, Jordan (Megan) Elmore, Braydon Elmore, Cole Elmore, Paul Adkins, and Bryce Adkins; great-grandchildren Lauryn, Kinley, and Camden Elmore; siblings Metta Lou Carnes of Effingham, Delores Staley of Newton, Kit Carson Elmore of Lawrenceville, and Lee Larson Elmore. His parents, wife Carol and brothers Abraham and Byron Elmore preceded him in death. To plant a tree in memory of Larry D. Elmore, please visit our Tribute Store. "Email Address" would like to share the life celebration of Larry D. Elmore. Click on the "link" to go to share a favorite memory or leave a condolence message for the family.